2016 is about to see its final days and things are calming down, so Frank and I thought about the year that lies behind us. 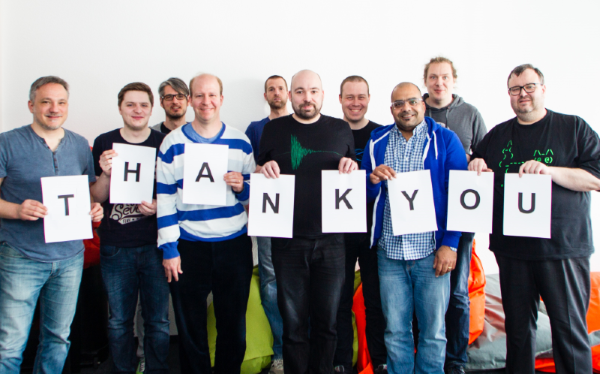 It was a really exciting year for the whole ArangoDB project and for us as founders. In 2016 we saw our team doubling in size, ArangoDB 3 series got launched and we became part of the Target Partners family. Many other great things happened this year and with this post we want to take the chance to say “Thank you” to all our supporters. For the whole team it was and is super motivating to see that practically the same growth we experienced team-wise happened to the ArangoDB community. Exceeding the 3000 stargazer landmark right before Christmas was indeed a nice present, but it also reminds us that more and more people rely on what we create. Without the support of so many people on Slack, GitHub, Stackoverflow and other channels sharing their feedback, helping others or trying new things based on ArangoDB, the project would not be where it is today. “Period”. So guys “THANK YOU” so much for all your ideas and detailed feedback to new releases! From a technical perspective ArangoDB also made some huge steps forward this year. With a larger team we could finally tackle bigger things on our list. The resilient cluster management including our Raft-based Agency, implementing our binary storage format VelocyPack or releasing the first Enterprise Edition including ArangoDB SmartGraphs are important steps towards our vision of simplified data work. We are excited to hear more about your ideas that you can either describe by filling in our community survey or opening an issue on GitHub. We are looking forward to taking some ideas for a spin. From a business perspective 2016 went pretty well for ArangoDB. We could nearly double our customer base over the year and could even win five Forbes 100 companies for the multi-model idea. We hope that we can share more info within detailed case studies soon and show the great work of other teams around the globe. What we also recognized is that since our 3.0 release, including the overhauled cluster management, the number of business critical use cases grew as well and we are proud that teams have built trust in ArangoDB and its capabilities. These positive news have been recognized by investors, too. Just a few weeks ago we could announce the next funding for ArangoDB and that we became a proud member of the Target Partners family. With Target Partners we won Germany’s leading tech investor for our multi-model vision and with their partner Kurt Müller – a seasoned, smart and great mind to guide us through the next steps. Thank you, Kurt! and Thank you, Target Partners-team! for your trust, vision and guiding thoughts! A big warm thanks to all our partners who contributed to the project’s development and growth! Especially our friends at Mesosphere and DC/OS for supporting us every step of the way. I already mentioned in the first lines of this post that all of this would not be possible without a great team and even better teamwork. So this post is also about thanking our team members who build ArangoDB from the first line of code onwards. We want to take the chance and thank our existing team for their deep and early trust in the multi-model idea and want to welcome our new team mates. Growing as a company in a highly competitive market also requires great minds on the business side of things. We are more than happy that we could win 4 great minds for our advisory board contributing their decades of experience and knowledge into ArangoDB. Without you guys ArangoDB would not be possible. All the feedback – good or constructive – guides us in the right direction, lets us learn what we didn’t think of and leads us to new ideas. I will not try and list everyone who supported us throughout the year, as I would end up writing a “100 pages” long essay 🙂 . But we are eternally grateful for every single contribution! All of you did remarkable things for the whole project and the community. I could go on and on talking about all the wonderful clever things the community did for us this year, but as mentioned before the list would be endless. As founders, Frank and I are so grateful for all your support, inputs, thoughts and trust in what we all are building here together. We are already so excited about the future steps and hope that we will see you and new people creating brilliant stuff based on ArangoDB in 2017. Thank you again for a wonderful 2016! And a Happy New Year! Claudius studied economics with business informatics as key aspect at the University of Cologne. Together with his co-founder, he builds databases for more than 20 years; from in-memory to mostly memory databases and from K/V stores over multi-dimensional cubes to graph databases. His responsibility was mostly the product and project management. Since 2012 he is the CEO of ArangoDB.